Happy New Sketching Year from USk Brisbane. We have had a terrific year of sketching in 2015 and are looking forward to another in 2016. Thanks to the enthusiasm and energy of our main organiser, J-J Bell, (Judy-Joy) we have had a sketch-out attended by as many as twenty sketchers almost every Tuesday and Saturday during the year, and members have also been encouraged to share their other sketches done outside of the organised meets on the Brisbane USkers FB Group. 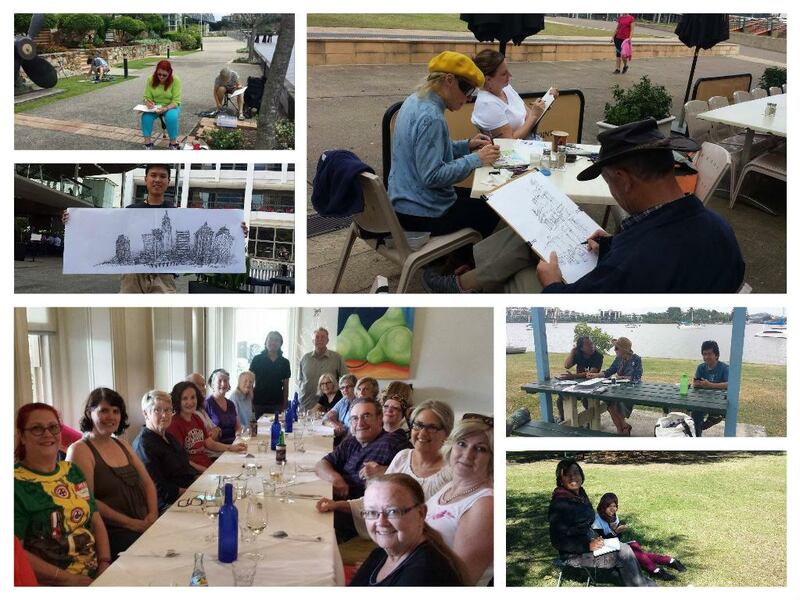 The regular sketchers of USk Brisbane are varied group. We are lucky to have some professional artists and architects and talented amateurs, and an enthusiastic contingent of international university students. We have also been fortunate to have some interstate and international sketchers come sketching with us in 2015. Sketch-outs have been held in central Brisbane and surrounding suburbs, and we have returned to some popular venues such as Southbank and Roma St Parklands a number of times. 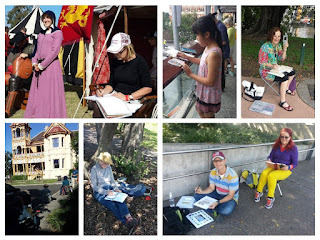 An early highlight of the year was the history re-enactment weekend 'History Alive' at Fort Lytton, at the mouth of the Brisbane River, where we sketched re-enacters in knightly costume; and it was amusing to see WW2 Axis and Allied soldiers having morning tea together. One of our members was able to get permission from the Wesley Hospital to sketch the historic Moorlands House in the hospital grounds. 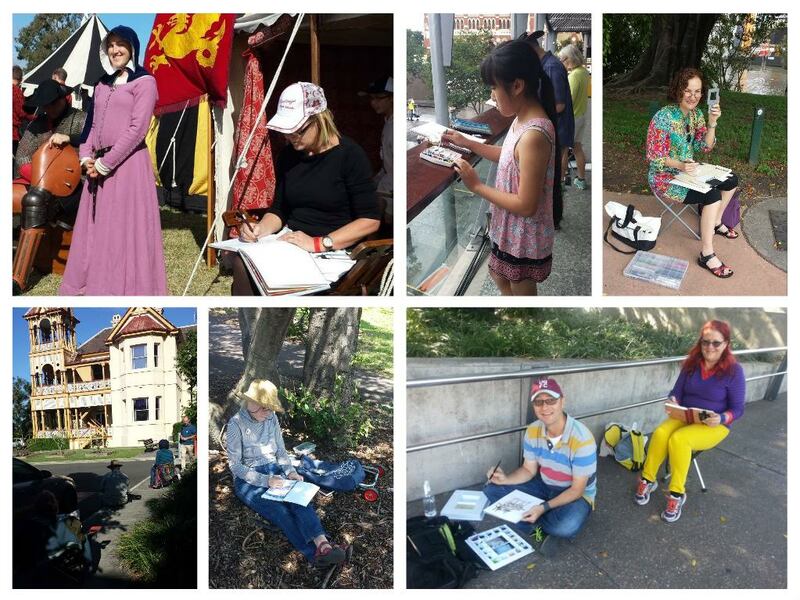 We also had sketch-outs at the Korean Festival, the Scandanavian Festival and Doomben Race Day. We were also given a space to display our work at the Bulimba Art Festival. The 100 years of Qld Rail Celebrations and opening of the newly restored Platform 3 at Roma St Station, gave us the opportunity to sketch a historic rail-motor and the restored platform. 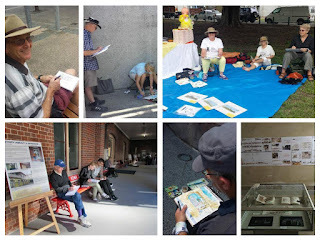 While we were sketching we were observed by the manager of the platform restoration, this led to an offer to display some of our sketches at the station museum for the Brisbane Open House week. Our last 'special' sketch-out was in December when we sketched Parliament House then met for a Christmas party at the historic Mansions restaurant, where all sketchers brought a gift wrapped sketch for a Secret Santa draw.